All cargo is subject to security search. All cargo must have a valid booking issued from RTM Lines representative. All cargo must have accompanying Shipping Note (a.k.a. Dock receipt). Shipping note shall at least indicate the following: Shipping Marks (Unit VIN (Vehicle Identification Number) / chassis number / ID) Booking number and vessel / voyage number Port of Discharge / Destination. Cargo unit’s dimensions and weight. All cargo must be clean (free of accumulated materials), with no leaking fluids and no personal effects. All cargo is subject to third party measurement audit to ensure safe handling and correct freight. All movable parts must be secured mechanically. Cargo not to be accepted without written pre-approval from RTM Lines representative, as follows: Units with welded or otherwise inaccessible areas Cargo units/parts in a condition which cannot be properly stowed and lashed for a sea voyage Plastic Drums Palletized bags Loose pipes Cartons Cases/crates/cartons containing vulnerable and expensive cargo, e.g. electronics/glassware Units not meeting additional policy criteria pertaining to the cargo type, condition, and age. Non-running units unless equipped with designated towing appliance. Drivable units not to be accepted without written pre-approval from RTM Lines representative, as follows: Wrecked units (contact RTM Lines Representative for local wrecked unit definition). Units with flat tires. Units without sufficient fuel for Ro/Ro load / discharge. Units with steering, brakes, hood-latch mechanism, transmission, or ignition components that are not in a working condition. Units with obstructed driving conditions (operation or vision). Units with broken glass, sharp metal edges, or other conditions dangerous to life or property. All drivable units must be furnished with operation key, or key card, or code, or similar functional substitute. Batteries may require disconnection and/or removal and fuel tank may require draining and / or removal, if any of the following conditions exits: Fuel-tank is damaged. Water flooding damage is evident. Electrical malfunction is evident. Sophisticated Ro/Ro cargo is defined as high-tech, remote controlled, special equipped, and computer controlled machinery or vehicles which require specific operating procedures outside the norm of everyday equipment. Units must have handling instructions located within or around the operating / driving area. The instructions shall, at a minimum, contain the following: QUICK GUIDE: Starting and Driving (English language). BATTERY HANDLING CARE: i.e. jump start / hot wiring warning or instructions. 24 HOUR PHONE # for cargo representative / technician in load and discharge port in case operating assistance or repair is necessary. The shipper and receiver should prepare to assist, where necessary, to facilitate load / discharge operation. It is recommended to contact RTM Lines Representative for coordination. RTM Lines will only accept cargo units/parts that are accessible (countable and available for inspection). Items stowed on vehicles must be clearly visible for inspection and not possible to construe as concealing any other items. Personal effects in vehicles are not accepted. A schedule or list of all cargo parts shall be stated on the shipping note, manifest and B/L. It is not sufficient to mention parts only. Manifest and B/L to read: “Cargo parts shipped at Shipper’s risk, Shipper’s load, stow and count. No claims accepted. “RTM Lines can accept Motor homes/yachts as long as following requirements are followed: Standard equipment and limited items of kitchen utensils are acceptable only for Motor homes and similar vehicles. Standard factory fitted equipment of motor homes/yachts (e.g. awnings), are acceptable. Vehicle emergency flares or any other kind of pyrotechnic equipment in vehicles are not accepted. All movable parts must be secured mechanically. An Equipment design / drawing plan must be provided to RTM Lines Representative prior to booking. 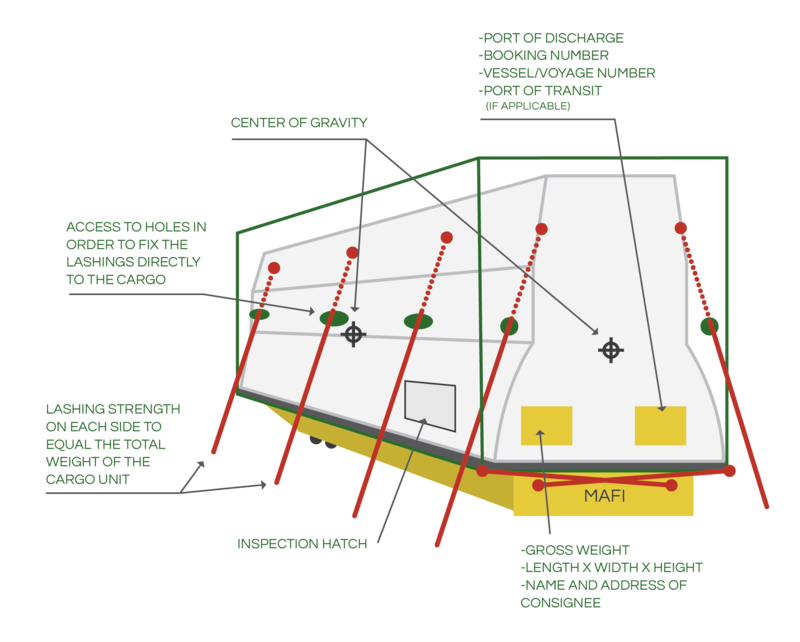 Plan shall contain markings for lashing point’s location and mean safe load. a) Static cargo inside a box / crate shall be adequately secured to prevent any movement or loose items during cargo operation and sea transportation. b) Marking of each piece’s weight c)Marking of each piece’s center of gravity. d)Marking of sling and fork lift points e)Capable to be lashed at a height at or above the center of gravity f)Lashing capacity which is capable to withstand forces of at least equal to the total weight of the cargo on each side (2 sides – port and starboard) and allow for equal distribution of such forces from at least 4 points g)Marking of lashing points h)Marking of safe stacking loads i)Packing or containment designed and capable of sustaining sea transportation and cargo handling j)All contents inside box / crate to be accounted for, and packing list to be attached k)Delivered and available for terminal preparation according to carrier local requirements. Crane hire or other preparation needs may require earlier delivery. It is recommended RTM Lines representative is contacted for coordination. NON PACKAGED equipment accessories, less than 6 mt. (small excavator buckets, small counter weights, fork lifts forks, etc. ): Items B, C, F, G are not applicable. 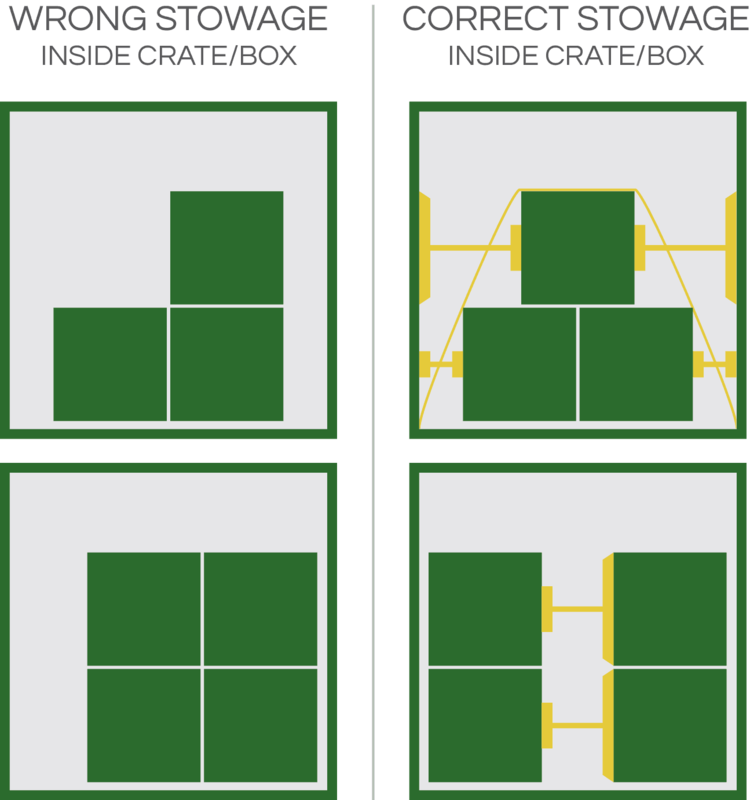 Direct access to the packed unit for lashing (at or above center of gravity) Crate to be of sufficient strength to allow forklift handling each crate/box to have inspection hatch. Shipper’s Cargo Stowage and Securing Declaration provided to RTM Lines Representative prior to booking. All wooden packing material and tonnage used, must be treated and marked in accordance with ISPM (International Standards for Phytosanitary Measure or Invasive Species and Pest Management). These Cargoes are only accepted in approved cases. Contact local RTM Lines Representative. Portable tanks and road tank vehicles that have carried any type of dangerous goods must be equipped with a certificate showing that the tank has been cleaned and gas-freed and is no longer considered IMDG cargo. Empty tanks, not cleaned and not gas-freed must comply with the same requirements as tanks filled with the previous substance. Break-bulk, Ro/Ro machinery, or vehicles shipments to Australia are subject to regulations of Australian Quarantine and Inspection Services (AQIS).All cargo shipped to Australia will be inspected by AQIS upon discharge from the vessel and in order to be imported the cargo must pass this inspection. AQIS require cargo to be presented in a clean condition whereby “clean” is defined “as new”. Please note, AQIS inspections are arranged by the consignee and at their expense. RTM Lines reserves the right to reject cargo for shipment not presented in a clean state. We do not, however, take responsibility for cargo that is declined import into Australia by AQIS as this remains the responsibility of the shipper/consignee. Please do not hesitate to contact your local RTM Lines Representative should you have any queries. Abandoned cargo policy – USA Vehicles remaining on a marine terminal over 60 days will be considered abandoned. An abandoned cargo form letter will be sent via registered mail or courier to any owner, or owner’s agent as shown on the dock receipt when a unit has been considered abandoned. If said cargo remains at 90 days, it will be seized and removed at the owner’s expense. All Shipping Notes / Dock Receipts shall be stamped with the following information: “Vehicles remaining on this terminal over 60 days will be considered abandoned. At 90 days abandoned cargo will be towed-away at the owner’s expense. “For cargo deliveries outside of the USA, contact your local RTM Lines Representative to inquiry on local abandoned cargo policy. No work by shipper or shipper’s representative shall be permitted by RTM Lines on accepted cargo. Marine Terminal Operator may set hourly labor rates, and contract directly with shipper for repairs. For cargo repairs outside of the USA, contact your local RTM Lines Representative to inquiry on local cargo repairs policy.